First solo album from the ex-Weather Report bassist, group he left to work with Cobham, but he started recording his own solo albums, and Moonshadows is his first. 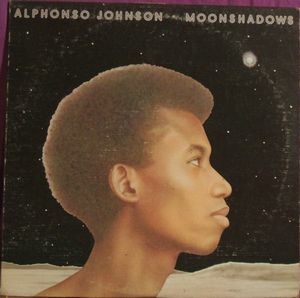 Released in 76 on the Epic label, the album might have switched front and back cover illustrations (nit- picking, here), but Alphonso chose some mighty friends for his debut solo: Leon Chancler, Narada Walden, Alphonse Mouzon, Flora Purim, and hubby Airto Moreira, Bennie Maupin, Ian Underwood, just to name a few. Johnson was first a stand-up or contrabass player, but switched to electric bass and became one of the Chapman stick explorer and there is all three on this album. Despite the many Latin-American players, this album is not as ethnic as you'd fear it to be, especially knowing that Johnson was still in WR's Black Market. You can't really label this album as jazz-funk either. It's probably best to describe it as fusion or jazz-fusion and in that regards, it's fairly typical of mid-70's album of that microcosm. Starting on a typical jazz-funk of Stump, the album moves quickly to a slow-starting Involuntarily Bliss and the music gradually picks up, only to return to the smooth gliding layers of the start of the track with Flora Purim's aerial scats. Not fascinating, but soothing. Cosmoba Place starts on a descending guitar riff, but it soon dissolves to make space for a piano ostinato, before the guitar returns in rock-fashion histrionics with excellent drumming (Walden I gather) before moving on to other delightful passages. Excellent stuff. Maupin's typical bass clarinet opens Pandora's Box over cymbal scratches, but there is little happening, besides a slow pedestrian bass. Another funk-jazz track, Up From The Cellar, opens the flipside (which unlike the other is not all Johnson-penned) and you'd believe you're on a Mysterious Traveller album, if it wasn't for Purim's soft singing, Alphonso's ultra funk and technical bass being the centre of attention. Certainly the weak track on this album, IMHO. Amarteifio is a quiet and slow soft jazz that oozes boredom over sea waves. On The Case is the more essential track on this side, with a strong rock-like guitar over a Rhodes-led funk-rock with lots of bravura. The closing track is an ambitious (but flawed) uptempo jazz-rock piece that moves into different passages (some convincing, others less), but the pompous vocals ruin it partially. An interesting album that shows Alphonso's greatest strengths AND weaknesses at the same time and has certainly not revolutionize the JR/F genre, but to those interested in WR? related works, Alphonso's first solo album is certainly worth putting an ear on it and even own it if he wants to consolidate his JR/F. Not essential or groundbreaking, but good enough to draw your attention, despite a few flaws, but personally I'll pass on it.